Modern hang gliding, as we know of it today, began here in Australia in 1963 when John Dickenson invented an "Improved Gliding Apparatus" in Grafton, New South Wales. Since then, hang gliding has become quite a popular air sport and it is highly recommended that those who are interested undertake an instructional lesson from a trained professional in order to gain a more thorough understanding. 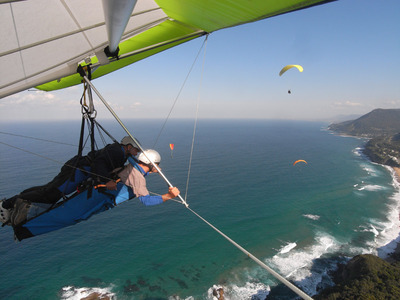 The most famous place in New South Wales for paragliding and hang gliding is Stanwell Park, located fifty minutes drive from the Sydney CBD. Stanwell Park is located south of The Royal National Park and is surrounded by bushland and beautiful coastal views. If visitors are lucky, they may even spot a whale off the coastline, as it is also a well-known destination for whale watching. 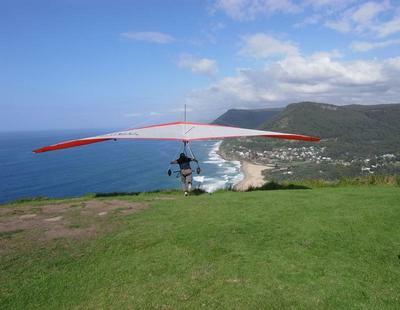 Sydney Hang Gliding Centre has been in operation since 1982 and is located at Stanwell Parks' famous Bald Hill. The company boasts a perfect safety record, as well as one of the most qualified and respected Chief Flying Instructors in the country – Chris Boyce. Sydney Hang Gliding Centre offers both tandem flights and a Licence Course where participants are taught the necessary skills to fly solo. The tandem flight begins with a 30-minute lesson whilst on the ground where participants are shown how to assemble the equipment. The Instructor and flyer are in the air for a total of 25 – 30 minutes. Sydney Hang Gliding Centre is available to fly seven days a week, but only if conditions are suitable. The Licence Course runs for 10 - 12 days and allows participants to obtain their Restricted Licence, which enables them to fly solo without the aid of an instructor. The course includes two audiovisual classroom theory seminars, as well as an examination at the end of the course. Students also undertake many practical components such as practising take-offs and landings on the low Training Hills and then progress to the Higher Hills. They will also go on a number of tandem flights with their Instructor before practising solo flights for three days. 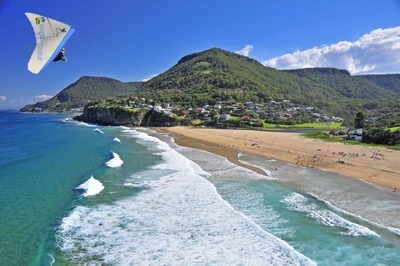 Warren Wind Sports also operates at Bald Hill in Stanwell Park, overlooking the coastline. The tandem flights are available to those over 14 years of age and the company states that although the flights are breathtaking and exciting, they are not physically demanding as the pilot will be doing all of the hard work. The tandem flight runs for a total of 90 minutes, including 15 minutes of basic ground school, 15 minutes of set up, 30 minutes of flying and another 15 minutes to pack up and have a chat. If weather conditions are suitable, flights run for seven days a week. Warren Wind Sports also offer a number of Advanced Training Clinics, however these are only available to qualified hang glider and paraglider pilots. The Ground Towing Course teaches participants about the various types of winches imported from the United States of America. The Aerotowing Hang Glider Course teaches participants about microlight aircraft that they can use to tow their hang gliders. There are also various other short Advanced Training Courses available, including: Cross Country Instruction, Landing Clinics, Hang Gliding Tours, Parachute Safety Night and VHF Radio Rating. These courses are designed to further enhance the knowledge of solo hang gliders and keep them up to date with the latest in hang gliding technology. Hangglide Oz has been in operation since 1987 and offer tandem hang glide flights as well as lessons. Hangglide Oz is the only hang gliding school that operates at Hill 60 in Wollongong, as well as Bald Hill in Stanwell Park. Hill 60 is known for its' beautiful surroundings, including beaches, islands and an offshore bird sanctuary. Tandem flights on their own run for 30 minutes and gift vouchers for these are also available. The hang gliding lessons begin with a tandem flight where participants are taught basic control movements of pitch and roll. Lessons then progress to the small training hills in the Wollongong area and move on to ground skimming solo glides. Participants must be over 14 years of age and if weather permitting, hang gliding flights are available seven days a week.